Cucuta, Colombia – Ana Moreno stared at her four-month-old daughter, Deivismar, in a hospital bed in the Colombian border city of Cucuta. Just two weeks ago, Deivismar was near death. Not long after arriving in Colombia five months ago, Moreno gave birth to Deivismar, who is now being treated for malnutrition. Like Moreno’s case, health issues among children and young mothers are all too common here. Colombia’s border hospitals are at breaking point with the influx of Venezuelans arriving every day. Some are migrants who have fled in search of new opportunities abroad, while others cross back and forth to receive medical care they can’t find in their homeland. Many arrive with serious health issues, putting Colombian hospitals under intense pressure. According to Dr Atilio Rivera, Colombia team leader at Project HOPE, a global health and humanitarian relief organisation, one reason malnutrition occurs is that pregnant Venezuelans are malnourished themselves. Like basic foods, medicine is hard to obtain in Venezuela. People suffering from diseases and other conditions like HIV/AIDS, diabetes and tuberculosis require specialised medication and treatment, which is almost impossible to obtain in Venezuela. In Cucuta, Rivera’s team has seen a rise in Venezuelan migrants with malaria and dengue fever, diarrhoeal and parasitic diseases, skin diseases due to lack of water and hygiene prevention, as well as acute malnutrition in children under five years old. 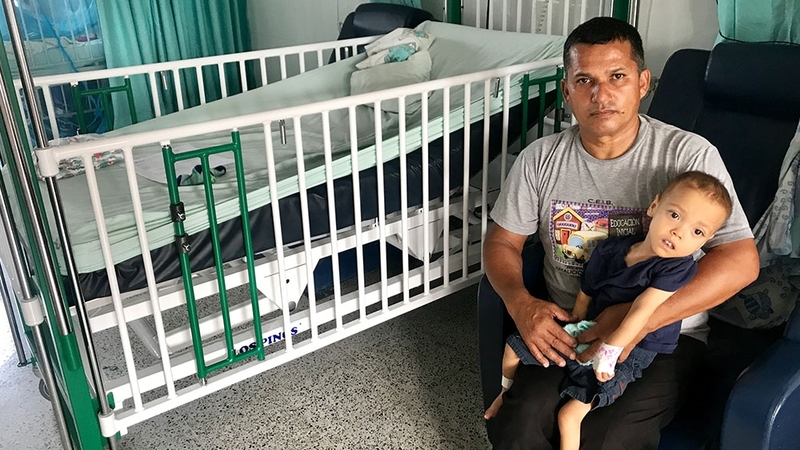 Wilfredo Mendoza, 42, arrived in Colombia from the city of Barquisimeto in Venezuela two weeks ago with his wife and three-year-old child, Samuel, who is seriously ill. They spent their first two nights in Cucuta on the streets, with nowhere to stay. At Cucuta’s only public hospital, Samuel has been receiving treatment for a condition that causes him problems when swallowing and has led to serious malnutrition. He takes an hour to drink a bottle of milk. Mendoza, a handyman, and his wife, a school teacher, said their jobs didn’t bring in enough to make ends meet. They even went to the market on weekends, to try and make some extra cash, selling whatever they could. 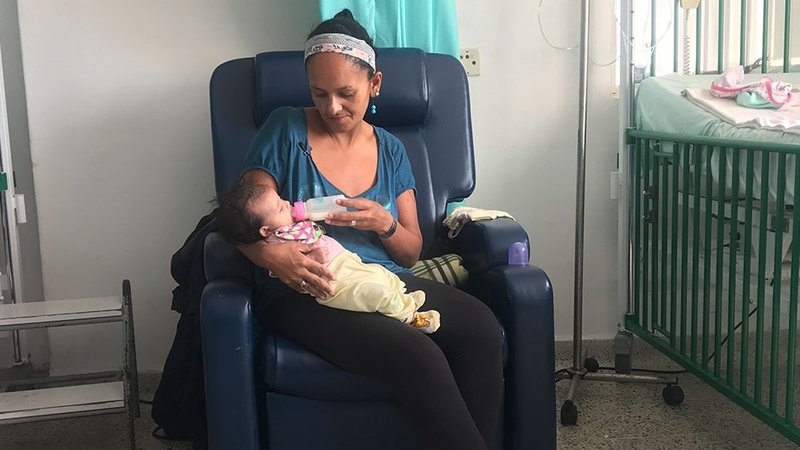 “At the moment we are witnessing the complications of the social problem that Venezuela has and it’s affecting all of our pediatric services,” said Deiner Arevalo, manager of the pediatric ward at Cucuta’s Erazmo Meoz hospital. According to Arevalo, around 70 percent of the hospital’s paediatric patients are Venezuelan at the moment. “They arrive with very complicated illnesses that have been either treated inappropriately or because of the lack of medicine and supplies in Venezuela,” Arevalo said. “So, usually, when they arrive here their illness is much more aggressive and they require a lot of care,” he added. “The doctors here say that we’re going back to the ’50s and seeing illnesses that hadn’t been around since then,” he said, pointing to illnesses such as tuberculosis, malaria and dengue. Venezuelan migration was unexpected and is something that was not included in the hospital’s institutional budget, according to general manager Dr Juan Ramirez. In 2015, the hospital cared for 600 Venezuelan patients. That number grew to 3,000 in 2016, 6,000 in 2017 and 14,000 last year, according to the hospital’s records. Ramirez also said that the government have provided them with little to no help in paying for the costs of Venezuelans, most of whom arrive without health insurance to pay for treatment. We have no jobs here yet. It’s hard as I have to be here at the hospital with her. I just hope things in Venezuela get better soon, so we can get back to normal. The Colombian government has promised to respond for the care of Venezuelans since 2017. In three years, over 25,000 Venezuelan patients have received care from Erazmo Meoz hospital, at a cost of $15m, but so far only two million dollars have been paid out. “The outstanding debt is almost $13m. The government said that the financial expectation for the Venezuelan crisis has overflown, and that they’re going to ask for international help, so that’s what we’re waiting on,” Ramirez said. Colombian government officials had not responded to Al Jazeera’s request for comment at the time of publication. The lack of medicine in Venezuela means that many of its citizens take to using homemade remedies, from plants, to treat pain and other illnesses as paracetamol and antibiotics are unavailable. He added there is one plant, called “boldo”, that has a similar effect to paracetamol when consumed, usually boiled and drank as a tea. The health professional added that the remedies come from “grandparents tales”, but need to be used with caution on children. Back in her hospital room, Devisimar’s mother looked on at her in despair, wondering what will become of her life.